Anyone who has ever been to New Jersey knows how a real Jersey Sub should taste. And it's that taste that has kept so many hungry people coming back again and again to Baldino's. We have offered that same great taste in our subs since the day we opened. 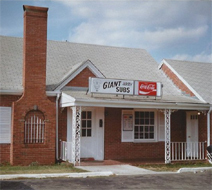 From our classic flattop style grilling, to the freshest ingredients all stuffed into a terrific Italian roll, Baldino's tradition continues to grow with the same great taste and quality that inspired our first Fayetteville location over 35 years ago. Now with more than 20 locations throughout North Carolina and Georgia, the Baldino's traditions continues with an ever-expanding line-upof new, fresh sandwiches, great sides and drinks to keep you coming back again and again. The proprietors of the Fayetteville area Baldinos, the Pappas family, would like to extend our deepest gratitude for your continued support. If there is anything we can do to make your experience more enjoyable , please let us know. And if you're one of our racing fans, please tell a friend!